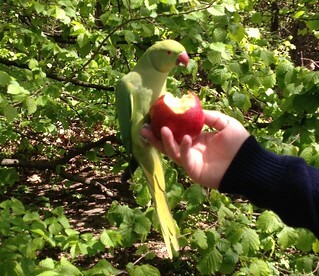 Wandering around Hampstead heath, we noticed some exotic green birds in the trees. These were down by the ponds, squawking and flapping around like we were in the rainforest or something. I couldn’t believe it! Apparently they’re not some londoner’s escaped pets, but a thriving population of ring-necked parakeets. They’re in Kingston too! I ve seen them on the trees by Kingston Hospital and Norbiton station. They re so cute!! Have seen them in south west London/Surrey & recently in Dulwich too. 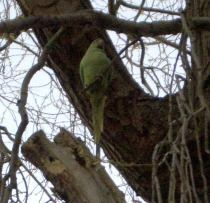 Yesterday I saw flocks of Green Birds, Parakeets as in turns out, in the grounds of Hampton Court and in Richmond. I could not believe my eyes and so had to look on the web this morning to check it out. Truly amazing. spotted three of these guys in Margate (south east kent). Whilst watching my lovely other half ref a footie match even though he did ask if i had drunk or smoked something i really shouldnt have!!! He did see one himself and is trying to tell me its a seasick pidgeon!!!! I saw 3 in my garden this morning and I live in the Harrow area. I’ve seen large flocks fly past several times from my office in White city and though i was going mad – my boyfriend told me they were parakeets and I laughed at him! then I saw two in my Garden this morning (in Harrow) and just had to check it out! incredible! Anyone got any better photos of them? Spotted a pair and one other in the same tree at Greenwich today. In the summer I saw a pair near the Thames at Staines. I saw two of these beautiful birds in Wimbledon. They seemed to be getting a hard time from some magpies. Hope the magpies don”t frighten them off. I was so amazed to see them. absolutely crazy!! iv seen two in the last 4 weeks…one in ealing another in harlesden! couldnt beleive my own eyes..i thought i was going madd..but seein as everyones seein them..oviously not! I saw three of these stunning birds this morning on a tree… so amazing! I live in sidcup kent near eltham place and i used to walk through eltham place for work every day this was about 5 years ago and i always saw them there they are gorgeous and have a gorgeous sound. Yeah their squawking is quite distinctive, once you realise where its coming from. Yes! There really is a bunch of rainforest birds in the trees! I am sitting in bed listening to the sound of these birds. There are about 20-30 of them outside in the trees in Whitton. We saw one last year and now there is a flock of them. Weird but amazing. Where have they come from? saw two flocks of bright green birds flying over the A40 at acton in london,,,thought i was day dreaming. We saw about a dozen this morning on a tree across the road in New Barnet absolutely amazing. There are four of them on the tree in my garden in Grange Park, Enfield. They came last year too! Beautiful when flying. Saw a flock of the green parakeets in a park in Slough. It`s nice to see such colourful birds here in England-makes a change from the usual brown/grey birds. They’ve been seen in North London – Muswell Hill eating apples from trees and grapes, thought they were a bit big for GreenFinches. 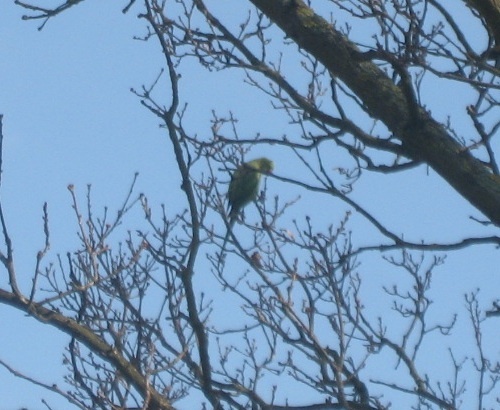 Just saw one of those green birds flying at the back of my house in Harlesden, North West London. Ended up landing in an evergreen tree. Looks extremely bright green in comparison to the grey skies of London. These beautiful creatures have returned to Northolt London today…they come every year….they make me homesick for Australia where many of the birds are brightly coloured unlike in London. I was trying to get another photo a couple of days ago in Hampstead Heath. They’re pretty easy to spot there. I live in Harrow and always have a flock of these parakeets flying over my house screeching at just after 6 p.m. every evening. I can tell the time by them. It would be interesting to know where they spend their day before they fly over every evening. There is a park nearby (West Harrow park), I suppose they could spend their day in the large trees there. my garden had 2 of them- they are sooooooooo beautiful! my house is in kensal rise. I got a bird feeder for Christmas and have kept it fully stocked since, and I have been rewarded tonight by a visit from one of these birds! I have to be honest, I assumed at first it was someone’s escaped pet! Just had a flock of them, maybe 30 or more, near our house (Near Beaconsfield, Bucks). VERY noisy, thought I was in a tropical forest for a moment ! They don’t seem to be interested in our bird feeder though. Just saw a flock on around 15 landing on the roofs of my estate! First time I have seen them! Beautiful!!! sorry, this was in Wembley. They are in nottinghill London seen them flying around pembridge square several times, it is a haunt of theirs and they fly so fast like bullets – when I first them it was like a green flash past the window squaking loudly. They are sitting in the tree opposite my flat window eating something – the fruit of a tree and looking at me a bit apprehensively. This morning my husband woke me saying he could see green birds on the apple tree. i had a look and shore was 4 green birds with red beaks and a long tail in East London walthamstow, Amazing! we need some colour in our london suburbs,beautiful colourful birds hope their here to stay. A bit of research and they are in the thousands in surrey and kent known as parakets. I Just saw these amazing beautiful parakeets where live in Austin, Tx. I thought I was losing my mind but after reading these messages I now feel better. What a beautiful site to see. It seems like the parakeet population in London has expanded somewhat since I first saw them back in 2008. Or maybe I’ve just been more attuned to the sound they make. I’ve even seen them in the park right outside my house on one occasion.